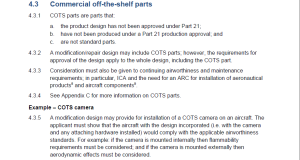 CASA’s view of the requirements for external camera installations is defined in Reference 1 (at least for certified airplanes). With respect to external camera mounts it is consistent with Reference 1. 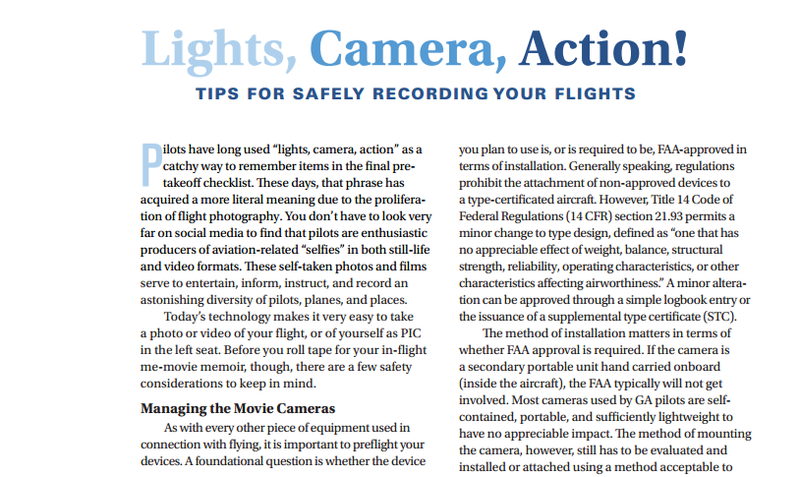 It also provides some guidance on internal camera mounts. Note that there is nothing in either of those Advisory Circulars which distinguishes between permanent and temporary installations as far as the requirement for needing specific approval – as an engineer I don’t have a problem with that. Let’s move onto Electronic Flight Bags. From an engineering point of view the considerations are quite similar to a camera of about the same size. Obviously we are only interested in internal installations so we have all of the requirements from Reference 2 to consider. But now look at Reference 3. 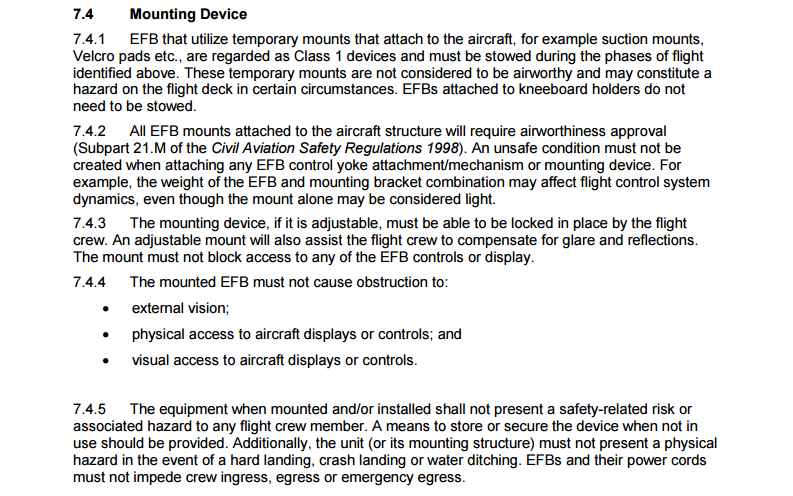 If attached to the aircraft structure then an EFB mount requires approval. Let’s consider two simple aeroplanes for discussion. Firstly, the Airtourer. Where can we mount an EFB that is not aircraft structure? I know that windscreens and windows have been used by some people however, being a former student of Henry Millicer, I know that the canopy and windscreen take about 20% of the total lift so therefore they are both part of the structure. The instrument panel must support the instruments and avionics up to the design loads so that is also a structural part. The instrument panel coaming supports the instrument panel and, as Henry told me, in an accident it was designed to fail at a particular load to allow the instrument panel to move forward. That doesn’t leave many options for the Airtourer apart from the internal cabin trim. Secondly, the Citabria/Decathlon series. Is the windscreen and skylight part of the structure? I’d say so as there are quite high loads on them in flight. As above, the instrument panel needs to support instruments and avionics so that is structural. Interior trim is not really viable. Window and door maybe? There are some very nice steel tubes in the cabin however that is primary structure so definitely cannot be used to attach an EFB notwithstanding that people hang onto them during aerobatics. Not many options there to mount an EFB. Para 7.4.1 refers to temporary as “not considered to be airworthy” and must be stowed during take-off and landing, turbulent conditions etc. 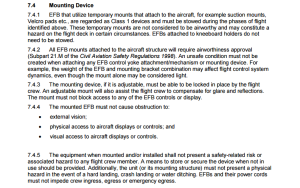 Presumably somewhere there is an exemption for temporary EFB mounts (whether temporary or permanent) to be attached to non-structural parts without approval? I cannot find it on the CASA website. Furthermore, it gives Velcro and suction mounts as examples of temporary mounts but no other guidance – I have seen GoPro mounts which require a screwdriver which I would regard as temporary? 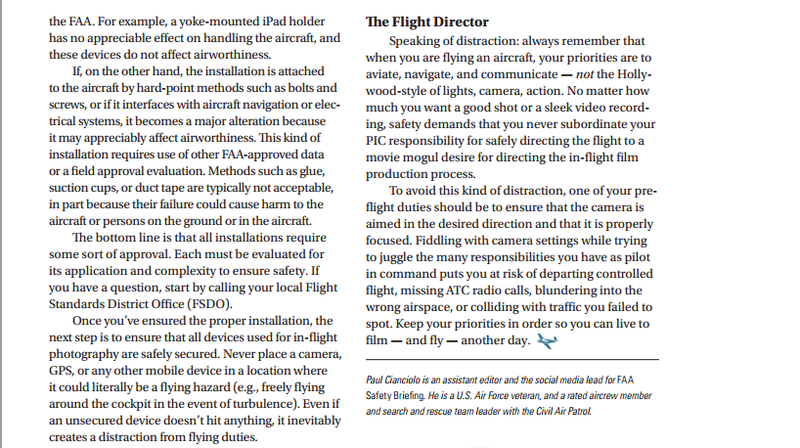 From and engineering point of view, the mounting of a small camera internally is quite similar to an EFB. 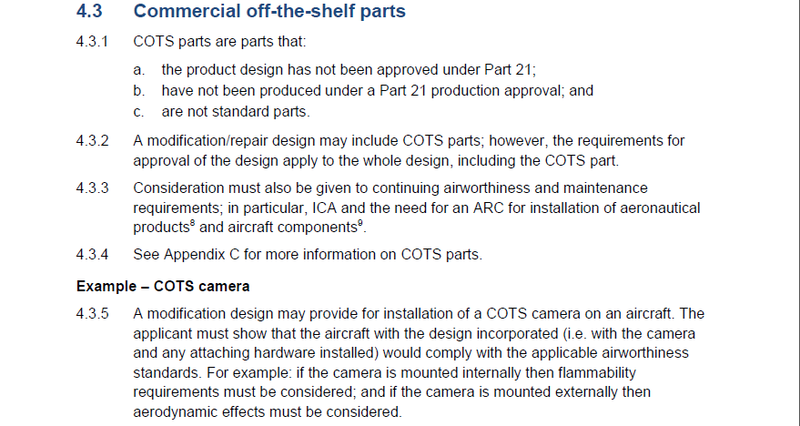 We don’t appear to have any exemption (not that I believe one exists for EFBs) allowing pilots to temporarily mount small cameras internally on non-structural parts. 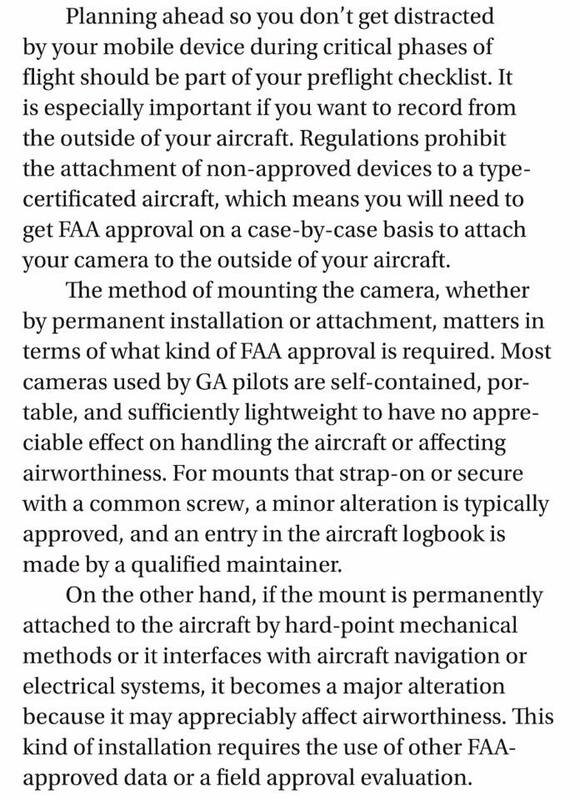 Regardless, pilots like to get video in situations where Reference 3 (assuming it applies) would require that it be stowed. 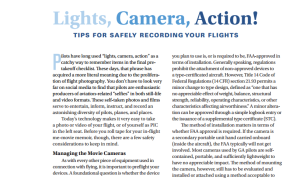 So, any camera mounted on an aircraft, whether external or internal and whether permanent or temporary requires approval. Personally, I use a kneeboard for my main EFB and my backup EFB goes in a pocket. 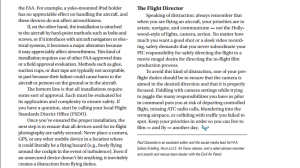 I hold a camera or fix it to my headset rather than mount it on an airframe part. Finally, Flight Fix told me that they expect to have an STC within a year (i.e. at Oshkosh in 2016) for their external camera mounts. 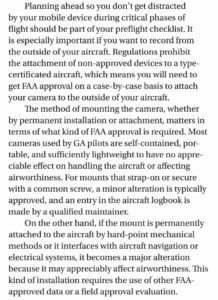 PS Feb 2016: I have just seen this very sensible CAP 1369 Policy and guidance on mounting cameras on aircraft from the UK CAA. “In the improbable event of an emergency, the clothes you are wearing can play a significant role in your safety. People wear synthetic blend fabrics …. However, they ignite quickly, shrink, melt, and continue burning after the heat source is removed. Wearing clothes made of natural fibres such as cotton, wool, denim and leather offer the best protection during an evacuation or fire. Avoid leaving large areas of the body uncovered. …. Wear non-restrictive clothing as this allows you greater movement. The most common injuries to feet during accidents or emergencies can be prevented by wearing suitable footwear. Wearing fully enclosed leather low-heeled laced or buckled shoes, boots or tennis shoes is recommended. So, the standard issue pilot shirt and trousers with synthetic underwear is not good for one’s survival in an accident where a fire is likely to occur (I know, it always happens to some-one else). I sometimes use Nomex gloves too – apart from the safety considerations it overcomes those unpleasant, sweaty hands on slippery control sticks. Plus: there are times when extras such as a Nomex flying suit, crash helmet and/or parachute should be considered. I explained this further with three articles in the first three volumes of the Australian Aerobatic Club’s Vitamin G magazine. All are woefully inadequate definitions of VA and it is particularly disappointing to see that CASA’s advice to aerobatic pilots is also inadequate. My tailwheel training course in the Super Decathlon does not conform to CASA’s Part 61 Manual of Standards for the reasons explained below. CASA requires take-off power to be fully applied before releasing the brakes – this is contrary to the Manual and is a common cause of nosing over. CASA requires rotation at the manufacturer’s recommended speed and climb at speed for obstacle clearance – rotate speed in the Manual is 43 kts – less than the stall speed and the climb speed in the Manual is 50 kts – very close to the stall speed. The Manual warns of risk of injury or fatality in the event of an engine failure in this situation. CASA requires application of maximum braking after touchdown at minimum speed – this is contrary to the Manual where the instruction is “brake as required” with a warning of injury or fatality due to the risk of nosing over. CASA requires the trainee to calculate the landing distance and promotes the falsehood that the short field performance can be easily achieved by an average pilot – this is not true of aircraft certified many years ago. 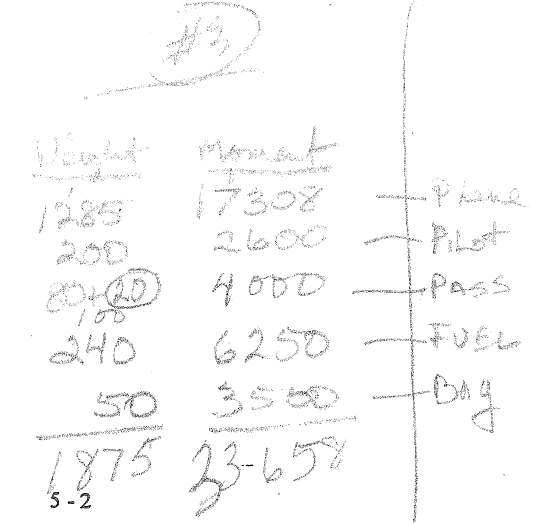 The Manual states that the landing distance data represents “maximum airplane capability at speeds shown and requires aircraft in good operating condition and a proficient pilot”. CASA requires that the trainee stops the aeroplane within the calculated distance. 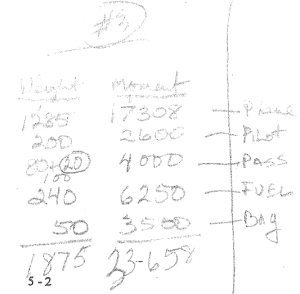 Landing approach speed in the Manual is 52 kts which is very close to the stall speed. The Manual warns of risk of injury or fatality with this technique and I repeat the above statement – the landing distances in the Manual will only be achieved using exactly those speeds specified with the various risks of damage to the aeroplane and injury or death to the crew must be highlighted. It is interesting to note that when Decathlons first arrived in Australia they were provided with new take-off and landing charts – so-called P charts. There was a take-off safety speed (that is a very informative term) of 58 kts. The landing approach speed was also 58 kts – about 1.3Vs. Those charts applied to the earlier model Decathlons with a lower maximum weight and have since been withdrawn. I see that the Manual for the new Xtreme Decathlon is differs from that of the Super Decathlon by specifying more reasonable speeds – similar to these P charts. Why did CASA change their definition of aerobatics? The USA and Europe have definitions which are almost exactly like the ICAO definition. The USA has an additional rule requiring the wearing of parachutes in some circumstances when an aircraft exceeds 30 degrees of pitch or 60 degrees of bank relative to the horizon; their definition of aerobatic flight, however does not specify pitch attitude or bank angle. EASA has an additional rule clarifying that training undertaken for a licence is not aerobatics. Why did CASA remove the word “intentionally” from the definition of aerobatics? Consider what CASA requires for training towards a licence and consider whether any unintentional wing-drop etc is aerobatics per CASA’s definition. Not a problem of course if it is a dual flight and the instructor has an aerobatic training endorsement. Author DavePilkingtonPosted on December 6, 2015 May 31, 2016 1 Comment on What is Aerobatics?